Strawberry jelly milkshake is a delicious drink. Drinking this milkshake helps you to makes the body temperature cools down and keeps healthy. 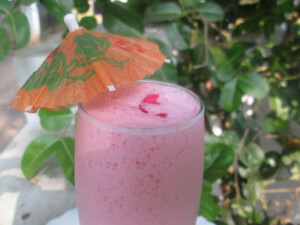 This is a special refreshing drink can be serve to the guests, friends and other loved ones. Consuming strawberry is good for the body. It is high in nutrients, vitamins and minerals, dietary fiber, manganese and more. It is good for the growth of brain, immune system, prevention again cancer, reduce the risk of heart diseases etc. Try this delicious drink & enjoy! Take a bowl then add 1 packet of strawberry jelly crystals and add 2 cup of boiled water. Stir well. Transfer to a mould and let it cool before putting into the fridge. Take a mixer grinder then add milk, sugar and jelly. Grind well. Tasty Strawberry Jelly Milkshake is ready. Serve chilled.